LG's Z360 is an Ultrabook that has a great, Full HD screen and some useful inclusions around its edges. We'd make some changes to its keyboard and touchpad, and we'd also add dual-band Wi-Fi, but we still think it's a good unit overall. We weren't expecting much from LG's first entry into the Ultrabook market, but there is plenty to like about the LG Z360. It has good looks, it's very thin, and it features a Full HD, 13.3in screen. It still makes use of Intel's third-generation Core i5 CPU, rather than a fourth-generation model, and it doesn't have a touchscreen either, but it still performs well, and we don't think the lack of a touchscreen is much of an issue. The white and black colour scheme makes this Ultrabook stand out, and it's 1.18kg weight and slim profile make it a joy to carry around — it's perfect if you want something to lug around every day. It deviates a little from a standard Ultrabook in the way that it's designed. 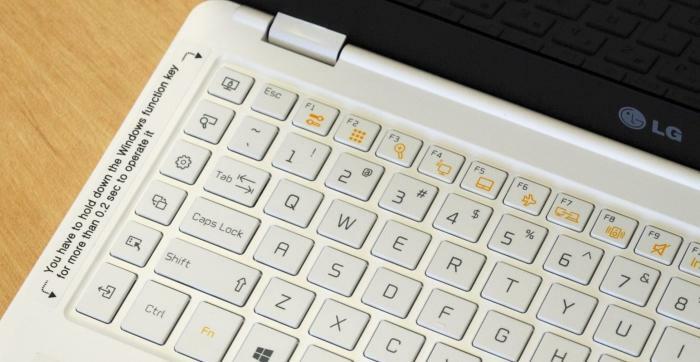 This is evident from the keyboard alone, which has an extra column of keys on the left side that can be used to invoke many Windows 8-specific tasks — among other things, these keys can be used to get to system settings and program search screens very quickly. We can take or leave this extra column of keys, but we mostly think it unnecessary and could have been left out in order to make the keyboard a little more comfortable to type on. As it stands, the keys on this Ultrabook are a little too small and spongy for our liking, and it takes time to get used to having that extra column next to the left Control key. On the other hand, we like the Function keys, which are clearly and colourfully labelled with the secondary function that they can accomplish. 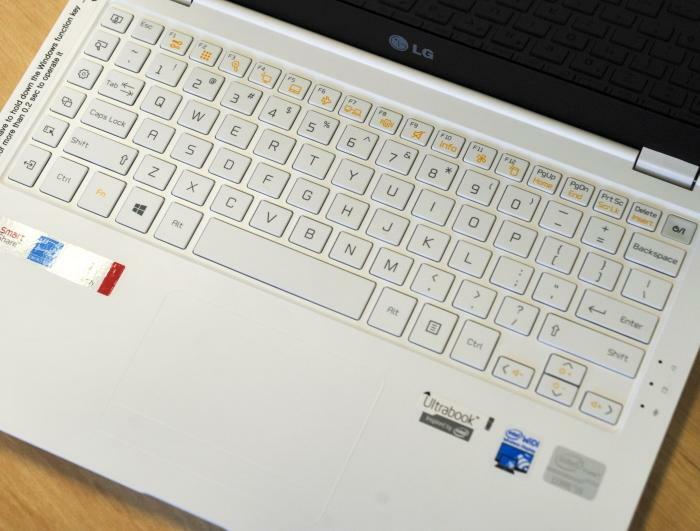 You can easily use the Function keys to get to the LG Control Centre (to manage system settings and power options), to magnify the screen, to enable 'Airplane' mode, or to change to silent mode (which slows the performance and makes the Ultrabook run very quietly). The last function worked without showing you any on-screen message that it was enabled; we only found out it was enabled because our benchmarks ran slower. That extra column of keys isn't necessary, and its inclusion means that the rest of the keys have to be a little smaller. It's worth noting that the power button is located on the keyboard tray right next to the Delete key, which means it's possible to accidentally press it in the middle of a fit of typos. However, it's a button that sits almost flush with the bottom of the tray, rather than raised like a regular key, so it shouldn't be a problem, even if your finger does hit it by mistake. The palm rest is large and comfortable, and the touchpad resides an equal distance from the left and right edges. The touchpad has the same texture as the palm rest and is only distinguished by a slight border. As far as touchpads are concerned, it looks and feels modern, and that's not altogether a good thing. It can take a while to get used to the way it feels, mainly because the left- and right-click buttons are touch buttons rather than physical buttons, and there is no clicking motion at all. The whole touchpad and button system is stiff. Because the buttons are the same texture as the touchpad, and because the touchpad is the same texture as the palm rest, in many cases you have to look at the touchpad to see what you're doing. The best part of the touch-based left- and right-click buttons is that they are silent, so there won't be any clicking noises when you use the Ultrabook in a silent environment (you will hear some fan noise, though). The touchpad blends in with the palm rest. You can barely see it (or feel it). We found the performance of the touchpad to be adequate most of the time (there were times the pointer felt like it was skating), and its ELAN-based driver supports three-finger flicks, which we love. (The last ELAN driver we saw on the Acer Aspire V7, for example, didn't support this gesture). Because the pad is almost flush with the palm rest, except for a little raised outline, it's one of the easiest Ultrabooks on the market on which to perform touchpad-based swipe-in Windows 8 gestures. We enjoyed accessing the Charms and swiping through open apps on this touchpad a lot. Because the screen is glossy, and because we're so used to seeing touchscreens on new laptops, we kept trying to touch tiles and swipe to navigate the Windows 8 Start screen. Of course, it's not a touchscreen, so we had to use the aforementioned touchpad to navigate the Start screen. It's a very good screen, though, with a rich portrayal of colours and enough brightness so that reflections off the glossy finish aren't really a problem (but they are still noticeable, especially in an office environment and when viewing a predominately black screen). Black was deep and white was bright, which made for very enjoyable photo viewing. Of course, one of the best things about the screen is its Full HD, 1920x1080-pixel resolution, which means it's a suitable Ultrabook on which to edit photos, and it also allows you to more easily multitask by placing two open windows side by side. Indeed, the screen is one of the best aspects of this Ultrabook. Another thing that we really like about this Ultrabook is the connectivity that it offers. Even though it's so thin (the base on its own is 12mm thick when taking into account the little rubber feet, and the Ultrabook as whole with the lid closed is 18mm), it still has two USB 3.0 ports (one on either side), and also a full-sized HDMI port (which we put to use more than WiDi when connecting this laptop to a TV). You also get a combination headphone/microphone jack. The left side has a USB 3.0 port, the power port, and a cable lock facility. The right side has the full HDMI port, USB 3.0, and the audio jack. 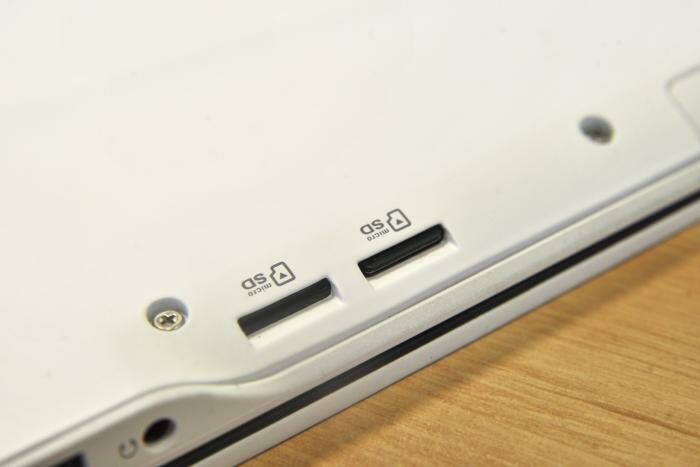 You can also just see the microSD card slots. But the most impressive inclusion is the dual-microSD card slot. It takes up a space that's about the same as what a full-sized SD card slot would take, but it allows you to install two cards at the same time to expand the Ultrabook's storage by up to 128GB (via two 64GB cards). It's a USB-based card reader, though. Read operations off a 16GB SanDisk Extreme microSD card peaked at 30 megabytes per second (MBps). On an ASUS laptop with a PCIe-based SD card reader, we achieved a read rate up to 87MBps using the same SanDisk microSD card. We like the dual microSD card slot, which makes it easy to keep one card in for extra laptop storage, while at the same time accessing a card from a phone or tablet. Having two microSD cards allows you to keep one in the Ultrabook on a permanent basis, while using the other to get data off a smartphone or tablet card. The downside of not having a full-sized SD card is that you can't get photos off a digital camera as easily, and this could be a problem if you want a thin-and-light Ultrabook for the purpose of transferring photos while travelling (it means you'll have to carry an extra cable or SD-USB adapter). As far as system performance is concerned, the LG has a somewhat common Ultrabook configuration that includes a 1.8GHz third-generation Intel Core i5-3337U CPU, 4GB of DDR3 SDRAM, integrated Intel HD 4000 graphics, and a 128GB solid state drive. It's the same configuration as the LG Tab-Book hybrid device, and while it got the same time in our Blender 3D rendering test as the Tab-Book (47sec), the Ultrabook was quicker in the iTunes MP3 encoding test, recording 55sec. The graphics performance was a little better than the Tab-Book in the latest 3DMark tests (it got 27132 for Ice Storm, 3164 for Cloud Gate and 433 for Fire Strike), and the SSD's performance in CrystalDiskMark was better, too (344.2MBps read rate, and 138.4MBps write rate). Our overall impression of this Ultrabook is a positive one. It has a solid and good looking chassis; we love the ports and slots that come with it, and also the Full HD screen. It performed pretty much as it should have in our tests, though we would have preferred a slightly faster SSD. We also think it should come with dual-band Wi-Fi. Its battery life was shorter than we expected, recording a time of only 3hr 24min in our rundown test (in which we disable power management, enable Wi-Fi, maximise screen brightness, and loop an Xvid-encoded video); we were hoping for a time closer to 4hr. The only other thing is that the keyboard and touchpad take some time to get used to. If we had our way, we'd remove the extra column from the keyboard and give more real estate to the main keys. We'd also give the touchpad a different texture to the palm rest, and some physical buttons. These issues aside, it's an Ultrabook worth considering for $1399, purely for its Full HD screen, its slim design, and the useful built-in ports.